In what will go down as one of the best Star Wars fan theories of all-time, fans have been rocked by a theory that comic relief, most hated character Jar Jar Binks wasn’t just a bumbling idiot that pissed everyone off in the theaters. In fact, there’s nearly irrefutable evidence that his complete character was just an act to shield the fact that he himself is not only a trained force user but that he may have been one of the most influential and powerful leaders of the dark side. This is the entire post that was made on Reddit. Furthermore, I assert that he was not, as many people assume, just an unwitting political tool manipulated by Palpatine– rather, he and Palpatine were likely in collaboration from the very beginning, and it’s entirely possible that Palpatine was a subordinate underling to Binks throughout both trilogies. So first, let’s establish Jar Jar as a skilled warrior. While this does not in itself necessitate a connection with the Physical Force, it’s highly suggestive in the Star Wars universe– very rarely do we see “normal” characters exhibiting extraordinary stuntwork or physical feats unless they are Jedi, Sith, or at least force sensitives. So here’s Jar Jar nonchalantly executing a standing 20 foot twisting somersault. Now, taken out of context, if you were watching a Star Wars movie and saw a character casually execute this maneuver, you’d probably assume it was a Jedi. In the context of Jar Jar, though, we don’t… because elsewhere he so thoroughly convinces us that he’s nothing more than a harmless dunce with his inane dialogue and cowardly-lion act. But is it? Obi-Wan warned us otherwise. This is one of the main reasons we as an audience hate Jar Jar so thoroughly; he breaks the fourth wall, he he shatters our suspension of disbelief, because we know that no one is really that lucky. We dismiss it as a lame, cliched trope– the silly pathetic oaf who always seems to inadvertently save the day. I posit that, instead, this is a deliberate facade on the part of Jar Jar as a character, and on the part of the writers and animators. As we know, the Jedi themselves are inspired by Shaolin Monks, and there’s a particular kung fu discipline that Jar Jar’s physicality is purposefully modeled upon which allows him to appear goofy and uncoordinated even as he lays waste to his enemies; namely, Zui Quan, or Drunken Fist wushu. This discipline seeks to imitate the “sloshing,” seemingly random foibles of a drunkard, but in reality the staggering and stumbling is the use of bodily momentum, deception, and unpredictability intended to lure and confuse opponents. Now as I said, we see Jar Jar catch hold of the balcony on the far right side, but then he drops to the ground on the far left. Easy to dismiss as a continuity or framing error, I suppose… except that one of the droids continues to fire on Jar Jar’s initial position, even as we see him drop elsewhere! See the droid that comes charging up, right behind the one Qui-Gon chops down? What’s he shooting at up there?? And see its head swing back towards Jar Jars new position after the shot? You can also see another droid behind it tracking Jar Jar with its head, and manage a shot on the new position. This means that the animators knew very well where Jar Jar was supposed to be- dangling from the balcony over Qui-Gon’s left shoulder- and purposefully animate the droids tracking his inexplicably fast movement elsewhere. I think what has happened here, even though we don’t see it directly, is that Jar Jar has purposefully split the attention of the enemies by grabbing on to the balcony as he falls, and then (using the force) propelled himself with a pull-up/flip to land in an unexpected place. In fact, this is a maneuver we’ve seen before… from a jedi. Twice, if you want to count Obi-Wan doing it in the Duel of Fates to take Maul by surprise. 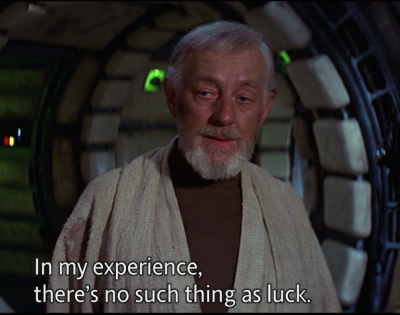 In addition to this kind of highly suspicious physical “luck,” I also believe that we’re given enough clues to justifiably suspect that Jar Jar is also a master of Jedi Mind Control. Consider: We hate the way Jar Jar influences major plot points for the same reason we hate his physicality- it messes with our sense of realism. Two experienced Jedi on a serious mission would never actually bring someone that stupid along with them. No character that idiotic would ever really be made a general. They certainly wouldn’t be made a senator. How could anyone like Jar Jar really convince the entire galaxy to abandon democracy? That’s ridiculous. These things are just the political version of his physical “luck.” Inadvertent, seemingly comical bumbling that just so happens to result in astoundingly positive results. But what if it isn’t inadvertant, and what if Jar Jar’s meteoric rise and inexplicable influence isn’t the result of dumb happenstance, but the result of extensive and careful use of force mind powers? Jedi (and presumably Sith) exhibit telltale signs when using the Mind Trick to implant suggestions or influence behavior. For one, they always gesticulate and not-so-subtly wave their hands at the target. Jar Jar using Force Persuasion as he hand-waves the entire Galactic Senate and ushers in the death of democracy. Actually, if you watch the prequels with the idea that Jar Jar might be a manipulative, dark character, you begin to notice just how insidious and subtle his manipulation is, and how effective, in almost every sequence he’s involved in, and also just how hyper-aware of the overarching plot he really is. Examples: Jar Jar tricking the Jedi into traveling through the planet core (so that they need him). Jar Jar carefully causing a scene so that they run into Anakin. Jar Jar constantly mocking Qui-Gon behind his back while Anakin is watching (so that Anakin learns disrespect for Jedi authority early on). Jar Jar telling an 8 year old child that the queen is “pretty hot,” fanning the flames of the child’s infatuation that is exploited later on. I could go on. Now if you lend even the slightest credence to my above points, and acknowledge the possibility that Jar Jar might not be an idiot, you’re almost forced to conclude that Jar Jar Binks and Palpatine were co-conspirators. If Jar Jar is putting forth an elaborate act to deceive people, it means he’s not a fool… and if he’s not a fool, it means his actions in Episode II that facilitate Palpatine’s plans are not those of an unwitting tool- they are those of a partner. Remember- Palpatine and Jar Jar are from the same planet, which in the scale of the Star Wars universe is like growing up as next door neighbors. 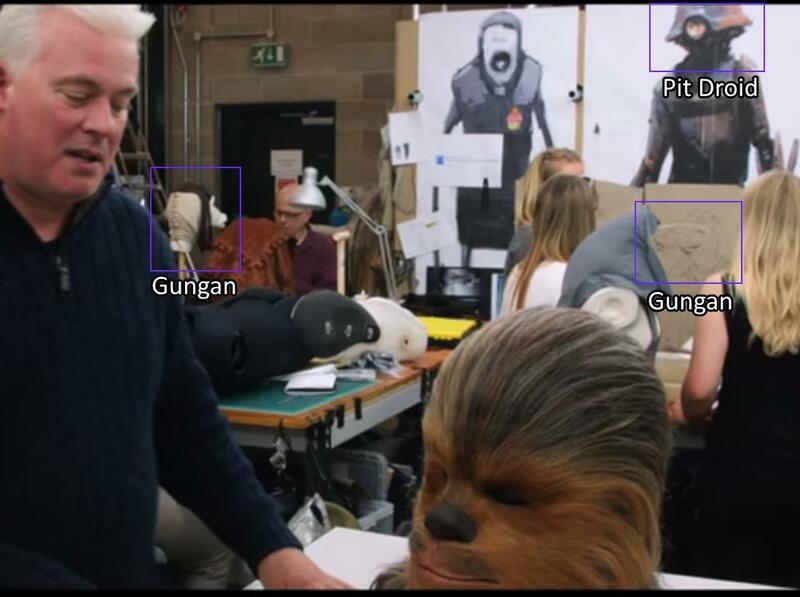 It’s entirely possible that they knew each other for years prior to TPM– perhaps they trained together, or one trained the other. 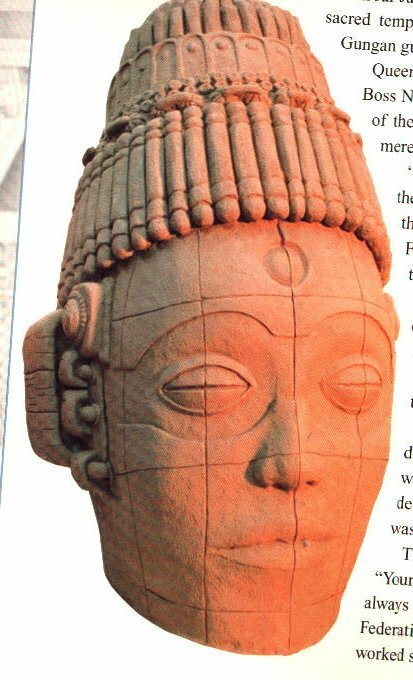 And Naboo is a really strange planet, actually; remember those odd ancient statues with the third eye? Naboo is the kind of place an “outcast” Gungan might find a Sith holocron or two. But that’s just speculation. 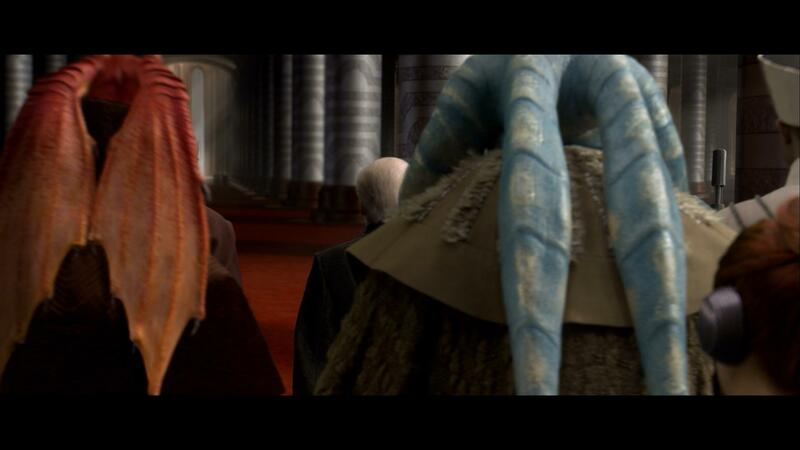 Let’s stick to what we know– what we know is that even after Palpatine is elected as Chancellor, years after Jar Jar has been “tricked” into helping elect him, Palpatine still hangs out with Jar Jar in RotS.. Why? Wouldn’t he be a constant source of public embarrassment? This is the same character who can’t walk five yards without stepping in poodoo or squealing like a rabid donkey, right? What use does he have now? Why is he still at the right hand of the most powerful person in the galaxy? Could it be that in fact Jar Jar is the most powerful person in the galaxy? Fine. Maybe. Hilarious conspiracy theory, but why would George Lucas bother to create this devious Gungan character with an elaborate conspiratorial past, but then never actually reveal his true nature? As we all know, one of Lucas’ big deals with the prequels was that they were intended to “rhyme” and mirror the original trilogy in terms of general narrative themes. So there should have been a seemingly innocent creature found on the side of the road that later reveals itself as a major player. We do have a creature that this seems to describe precisely… Jar Jar… but of course he never develops into a “master” anything. Here’s what I think happened: I think that Jar Jar was initially intended to be the prequel (and Dark Side) equivalent of Yoda. Just as Yoda has his “big reveal” when we learn that his tottering, geriatric goofball persona is just a mask, Jar Jar was intended to have a big reveal in Episode II or III where we learn that he’s not really a naive dope, but rather a master puppeteer Sith in league with (or perhaps in charge of) Palpatine. However, GL chickened out. The fan reaction to Jar Jar was so vitriolic that this aspect of the trilogy was abandoned. Just too risky… if Jar Jar is truly that off-putting, it’s potentially ruinous to the Star Wars legacy to imply that he’s the ultimate bad guy of the entire saga. So pretend he was just a failed attempt at comic relief instead. This is why Dooku seems like such a flat, shoehorned-in character with no backstory; he was hastily written in to cover the plot holes left when villain Jar Jar was redacted. Yoda was meant to duel with his literal darkside nemesis and mythological equivalent at the end of AotC: not boring old Count Dooku, but Sith Master Jar Jar. And Binks was meant to escape, not just that duel but to survive the entire trilogy… so that he could cast a shadow on the OT, too; you’d rewatch the originals knowing that the Emperor wasn’t necessarily the big baddie after all… Jar Jar is still out there somewhere. It would have been sort of brilliant. But I believe it is likely that the writers of the new trilogy will resurrect this idea. Most people seem to think that Disney wishes to distance or somehow disassociate itself from the prequels… but this doesn’t actually make any economic or marketing sense. There is far more prequel-era based intellectual property to capitalize on than there is OT, if only because of the Clone Wars movie and series. Billions of dollars in iconic toys, images, characters, games, park rides, etc that an entire younger generation grew up on. Disney is not going to pretend that over half of the $4 billion in IP they bought simply isn’t worth acknowledging. No, it stands to reason that one of their primary goals will be to reinvigorate and ultimately try to redeem the prequels in the eyes of the fanbase. To elevate and improve them retroactively, as much as possible. So how do you do that? Jar Jar Binks is Supreme Leader Snoke! I thought Jar Jar was a damn good character. Funny, goofy, a bit of a dork. But reading this… it makes me think. I watch Naruto and Rock Lee is a character much like Jar Jar. He’s a dork, funny, and goofy. But when he gets serious, he’s a master of the Drunken Fist. So much of a master, that in the flash back we get when Guy is explaining it to Tsunade, we see that it took Guy AND Neji to hold him back. And Neji was using Gentle Fist to paralyze him. Putting all this together, Jar Jar would make sense as a devious, hyper intelligent, Force Master behind everything. And I agree that ignoring the prequel trilogy would be a marketing disaster that would SINK the new trilogy. George Lucas had originally written Jar Jar Binks to be an assassin. Jar Jar had been written to be only acting as a fool. He was suppose to have been the one to kill Qui-Gon Jinn and attempt to kill Obi Wan. Obi Wan was suppose to survive the failed attempt. I don’t know what George Lucas had planned for the character otherwise. It is a shame that a last minute reaction caused the character to become the failing point of the 1 through 3. The Idea that Jar Jar is actually more than just an assassin, but a full fledged Sith would be amazing. This is something I read in an article around 1999 when Episode 1 came out and the backlash of hate for Jar Jar Binks started. Looking for it now, I can’t find heads nor tails of it. This would mean it has either been retracted, or buried under more Star Wars information (due to the new movies coming out) than I am willing to dig through. Without the article I originally read this in I guess this is just a factless rumor. This is a copy and paste from reddit. I linked it, but they deleted my comment. I think he’s neither aware nor trained but a natural talent and his clumsiness is caused by his connection to the force overloading his senses.